Before I start I have to say that I don't think I can do justice to this book. My language feels distinctly inadequate, limited and repetitive after having read such a well crafted, exquisite story. So I apologise in advance -perhaps I should just say that I've given it 5 stars instead of bumble through a review! As O'Farrell says, I too will not forget Pea, the main protagonist in this stunning debut. She is a heroine - a delightful girl who has the heart of an angel and the kindness of a fairy. Her voice is immediately compelling and I was transfixed from the opening page. Although only 5, her voice is endearing, yet fresh, and sometimes so starkly insightful it brings a lump to your throat. "Margot is like me and she is not like me. I am 5 and a half. Margot is only 4 but she's tall for her age. We both like cuddles and insects and cuddling insects and we both have freckles and green eyes, like Maman, with sparkles of blue and brown. In the sunlight Maman's eyes are kaleidoscopes. Margot and I are the same and not the same, you can tell by our dreams. I am always dreaming about witches chasing me, or picnic days at the beach before all the dying happened - these are the best ones. Margot dreams more about the tiny people that live in the cupboards and have parties on Thursdays, and about jigsaws that make themselves." "Jigsaws that make themselves" - I love that. So simple, yet so profound. A child's voice but a image that is laden with deeper meaning. This sums up Pea. Pea whose father has died in an accident, whose mother is grieving the recent loss of baby and now, heavily pregnant has neither the physical energy nor the emotional strength to look after Pea and Margot. The girls are left to play in the meadows surrounding their home, inventing games and setting themselves the daily challenge of trying to make their Maman happy again. Their life is a jigsaw of grief, loss, responsibility and worry which Pea and Margot try to put together again with their imaginary adventures. But despite a life of such a broken jigsaw with missing pieces, this is not a depressing read at all. Pea's voice is strong and her observations of the world around her capture her sense of bemusement, delight and discovery. We are gently immersed back into the world of a young child and invited to see the world from her perspective. King captures the voice of a 5 year old effortlessly. I was convinced from the start. "That [father's death] was tragic, the priest at the church said so, but afterwards it was a catastrophe." King has taken a few liberties with the voice but only to enhance the readability of the book. She ensures there are enough nuance and flourishes to remind us that this is a very young child. The conviction of Pea's voice comes from her innocence, naivety, Pea and Margot's struggle to understand the sometimes baffling behaviour of the adults and the lovely way in which a child can observe things yet completely miss their significance. The girls' quest to find happiness is heartwarming. They want to fix things and their innovative and imaginative attempts to do so are charming and delightful to watch. They use their "cleverness" again and again and the reader cannot help but fall in love with them and will them to succeed. King also uses metaphors throughout the poetic prose. Her imagery is stunning and there is a real sensory overload throughout the whole book. I was there. I was in France, in the summer, in the sticky heat, in the meadows and in the market place. Every sight, smell, touch or taste is captured and used to enhance the characters, the action and the plot. King also uses the imagery of nests, birds and flight which actually carry much more deeper, hidden meanings as the novel unfolds. The descriptions are perfectly beautiful. Pea's candid and spontaneous descriptions are incredibly effective. "Maman sits on the sofa, with her feet up on a stool and her plate balanced on top of her belly like a hat. I sit before her, just the tiniest amount of cool space between our warmnesses. It feels like nothing and everything." "Firstly Maman seems really angry and it will be better if we are not there to get under her feet when she has finished her argument and secondly because if we lean out of the window we can see better." I loved the dialogue and relationship between Margot and Pea. I find myself unable to think of any adjectives that would really do it justice or explain how well captured the dynamics are. They are so absorbed in their world, share so much, teach each other so much and the lovely attempts at assertion and superiority as they jostle against each other to prove their cleverness or competence are delightful, charming and heartwarming. Again, these keeps the tone light and gentle. Another image that repeats throughout the novel is that of fairy tales, fairies and witches. Josette's house is described as a cottage made of bonbons and cakes and I think the allusion to fairy tales is quite deliberate. We are after all seeing the world through the eyes of a 5 year old and we are also being lulled into a world where reality and unreality become blurred, where we are encouraged - just like Pea and Margot - to make sense of what we are told through stories and made up games. I really enjoyed the passage at Josette's house where she cuts Pea's hair by placing a bowl on her head. "Is she going to make you into a salad? says Margot. Or a cake make of hair?" The repetition of witches and Pea's fear of them reinforces King's exploration of dreams and happy endings. Pea can't articulate what it is she is scared of, she can't verbalise what her pain is or explain it and so she can't acknowledge it. The reader has to read between the lines, between the description, motifs and metaphors and begin to piece together the jigsaw themselves. At some point I realised just how magnificent King's writing was and just what depth was disguised within the prose. And then towards the end of the novel there is a slight dramatic increase in pace, action and tension. When I finished the book I felt bereft but I also wanted to turn back to the beginning and read it again knowing what I had now learnt about the characters. I think reading it again would bring as much pleasure as the first time and even more appreciation for King's exquisite writing. This is a story that will overwhelm you with the scent and heat of a summer in France, which will tickle you with the wings of a fairy and entertain you with the escapades of two young girls. It will also encourage you to see the world through new eyes - eyes which at times see things with more perception, frankness and profundity than any adult, while also not seeing the threats, dangers and complexity of what is happening around them. Not since "Finding Martha Lost" or "The Museum of You" have I fallen in love with such a character like Pea. King's writing reminded me of Carys Bray, Joanna Harris and Jo Baker. Anyone who loves a well crafted, beautifully written tale that is about characters will love this. It's as uneventful as a remote french village highstreet but as colourful as the wild flowers in the meadow, slow like a siesta but as lush and juicy as the ripest peach. It's a story about the blessings and perils of imagination and truth. It's about innocence, friendship, trust and love. There is grief, there is compassion. I just loved it. 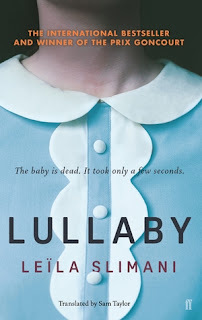 A stunning 5* read from me. 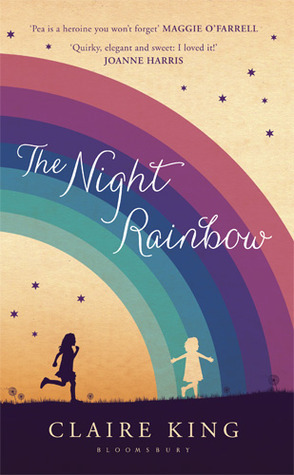 "The Night Rainbow" published in 2013.